When my daughter was in public school, she struggled with tests–which was a constant source of pain for her. I continually pointed out to her that she could not give her power away to a system that made up arbitrary rules about intelligence—and, that had, indeed, little intelligence itself. But this never penetrated. The stigma around failing is so effectively baked into our culture’s nervous system that it has not been rooted out of her. I venture to say that goes for the rest of us, as well. The philosophy prevalent in Silicon Valley affected me. I’m sure you know their motto–which has been criticized, but that nevertheless has inarguable wisdom in it: Fail fast, fail often, fail forward. They are—if not always succeeding, at the least attempting to create a culture where shame of failure is replaced by pride in failure. It is encouraged! Why? Because their position is that those who fail to do something bold will one day succeed at doing something bold. At the end of this reading marathon, (The Lean StartUp by Eric Ries; Getting to Plan B by John Mullins and Randy Komisar; Bold by Peter Diamandis and Steven Kotler; Zero to One by Peter Thiel), I emerged from the waters that tech entrepreneurs swim in every day…healed in some way. They have constructed an alternative universe with new rules work that work for them (as far as I can know, as an outsider)—and that can work for us all. It is not a Silicon Valley philosophy. It is universal wisdom. They have simply been bold enough to put it into practice. 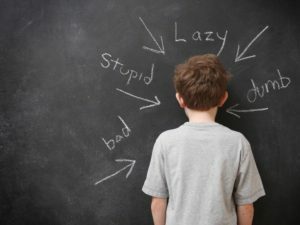 If they can do it, we, too, can remove ourselves from the childish system in which we’ve been raised, which demonizes mistakes, and reach instead for a reality based on a truer paradigm that has space and enthusiasm for failure. With those books metabolized within me, many tributaries began to converge. I thought of all of the clients who come to me, tattered and worn because the system told them what to do to succeed, but still, they struggle. And worse than any financial concerns they have, they carry shame over the failures because, according to the system, success is easy. They’re left with no other perception but that something is wrong with them that it has not been. I was delighted to see Eric Ries put a name to this nefarious system, calling it the “mythmaking industry”—and I was surprised to find that Silicon Valley has it, too. But, oh, how pervasive it is in the coaching/ consulting/internet marketing industry! Every day the vulnerable become prey to their puffed-up claims. And that’s when an idea for a fable-novella was born whose central theme would be about the stigma of failure and its twin, shame—and whose key solution to business struggle would be its banishment, tapping into some of what Silicon Valley teaches, as well as much that I do. 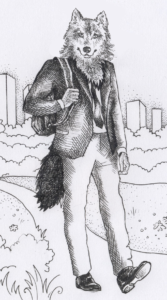 Over the next six months, the story unfolded of a lone wolf named Wolf, who leaves The Pack and Status Quo County to make a dent in the universe. It is a classic hero’s journey of trials and tests, fear and second-guessing; wisdom and triumph over the enemy—and the final “return,” where transformation is realized and shared with others. I also wrote this for my daughter, whose world-view I seek to shatter every time I text her, “How did you fail today?” Then, congratulate her heartily for whatever her response. And I wrote it for myself because I am much too hard on myself for even the slightest so-called failure. Among having other missions, I want to help create a new world where failure is exalted because it is the sign of daring heart and mind, and where shame is vanquished by a new strength of Self. This is when we will know we live in a society of true strength. 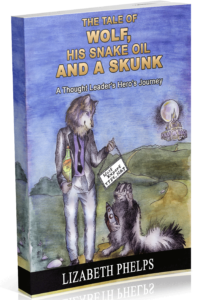 It begins with Wolf, His Snake Oil and a Skunk, which will be available soon—in a very unique form. Stay tuned for more details!